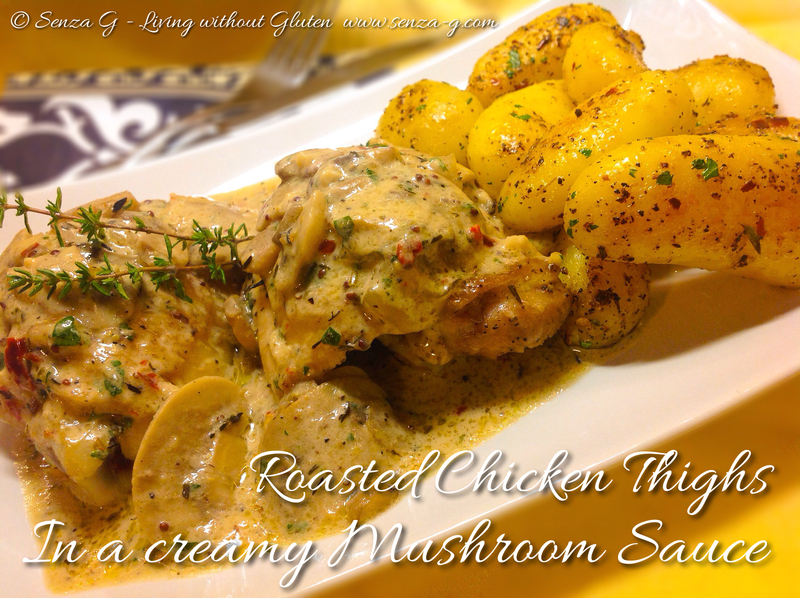 Chicken, mushrooms and cream … somehow they sound so good together … and taste even better! This simple recipe is made with chicken thighs, with the skin left on. You can use chicken breasts if you prefer, but make sure you cover the dish with foil as they roast in the oven so they will not dry up, then uncover during the last ten minutes of cooking, basting them with the sauce. Hope you will like it ! Preheat oven to 200 C. Season chicken thighs with salt and pepper. Take a large pan and brown the chicken thighs, skin side down in a little olive oil over medium heat. Cook until golden brown. Remove from pan and set aside. Add the sliced mushrooms in the same pan, then add the minced garlic and cook, stirring occasionally, for a few minutes. Season with salt and pepper, to taste. Stir in the wine, chicken stock, thyme, oregano, Mixed Italian Herbs and Chilli Flakes if using. Put the chicken pieces in an oven proof dish, pour over the sauce and place in the oven. Roast for about 25 minutes. Remove from the oven. Place the chicken pieces on a serving dish and keep warm. Pour the remaining juices in the pan into a small pot. Stir in the cream, the Parmesan Cheese and the wholegrain mustard. Bring to a boil and then lower the heat and simmer for a few minutes until sauce reduces. If you find the sauce too thin, add some cornflour combined with a little water, to thicken the sauce. Pour the sauce over the plated chicken. Sprinkle with the freshly chopped parsley.